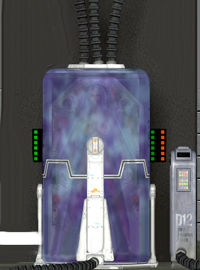 The Stasis Pod is an advanced machine that cyrogenically freezes whoever is placed within it, putting them into an artificial coma and keeping their body alive and healthy for extremely long stretches of time. The pod was developed years ago for medical purposes, specifically to preserve patients until cures for certain diseases could be found. Omega Woman was placed into a stasis pod when her powers were deemed to dangerous and unstable for her to safely control. She was lulled into a state of artificial sleep and kept in a secret location deep withinSuperheroine Squad Headquarters for decades before being released by Silver Satin, Mechana, and Dr. Twisted to combat Sentius and his H.E.R. drone invasion. Similarly, the body of the infamous Kikka Brust was placed in a stasis pod to preserve her body for study and observation after her untimely passing by Feelix Von Ick. She was eventually thawed out and resurrected by the misguided scientist Irene Webb. The pods were redesigned soon afterwards, with some of the victims of the H.E.R. Conversion Chamber being placed in cyrogenic stasis until their cybernetic implants could be removed from their fragile bodies. The pods were kept in Silver Satin’s crime lab until she and Ted Twiss could assist the women sleeping peacefully inside.